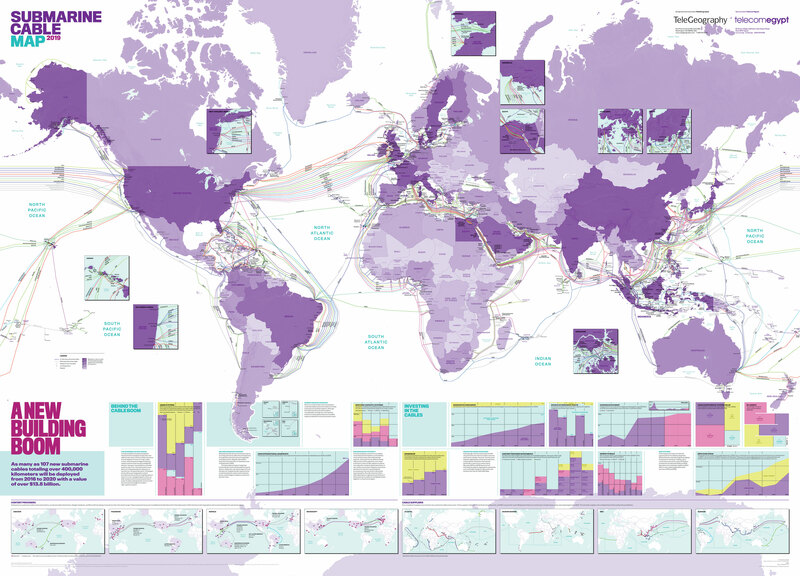 TeleGeography's Submarine Cable Map has been updated for 2019. This new edition depicts 420 cable systems and 1,106 landing stations that are currently active, under construction, or expected to be fully-funded by the end of 2021. As many as 107 new submarine cables totaling over 400,000 kilometers will be deployed from 2016-2020 with a value of over $13.8 billion. This is one of the reasons that our 2019 design is all about the building boom, singling out cables owned by content providers, including Hawaiki, MAREA, JUPITER, Dunant, and others. The map is printed on Yupo, a high quality synthetic material, and measures 36” x 50” (0.9144 m x 1.27 m). Heat mounting is not recommended. The flat version is rolled in a tube and shipped, which is ideal for hanging on the wall or framing. The folded version is creased and ideal for taking to meetings or keeping around your desk for quick reference.